The aphids spend winter living on host plants such as peach, apricot or plum, but in the summer months can colonise a huge range of vegetables - from potatoes to spinach, squash, parsley and parsnip. Generally, the insect parasites that live on a certain species are genetically very well adapted to live on just that plant. Yet, research led by the Earlham Institute (EI) and the John Innes Centre (JIC), has found that the green peach aphid foregoes this specialisation for a more flexible approach involving turning gene activity ‘up’ or ‘down’ in response to different plant hosts and environments. More intriguing about the insect's strategy is that aphids can reproduce clonally - i.e. they produce genetically identical lineages. 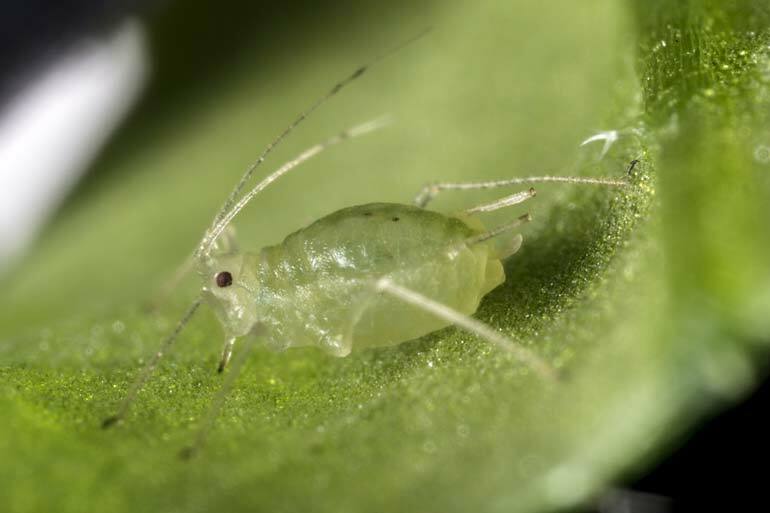 This allows biologists to compare individual aphids with the same genetic background and see precisely what genes are more active than others in aphids living on different plant species. The scientific paper, titled: “Rapid transcriptional plasticity of duplicated gene clusters enables a clonally reproducing aphid to colonize diverse plant species” is published in Genome Biology. This research project was led by the Earlham Institute (Norwich, UK) and the John Innes Centre (Norwich, UK) in collaboration with the University of East Anglia (Norwich, UK), INRA Rennes (France), University of Miami (USA) and Boyce Thomspon Institute for Plant Research (New York, USA). This project was funded by the Biotechnology and Biological Sciences Research Council (BBSRC), the United States Department of Agriculture (USDA) and the National Institute for Food in Agriculture (NIFA), (USA). For further information, read our feature: Aphids - the versatile agricultural nuisance. Watch Genome Biology's video on Gene regulation, the secret to aphid's wide-ranging crop diet. 1. The ability of one genotype to produce more than one phenotype when exposed to different environments - phenotypic plasticity allows an organism to change its phenotype in response to changes in the environment. 4. David Swarbreck and Tom Mathers (joint first author), Earlham Institute project leads are available for interview.